Kosamalli is one of the favorite side dishes in Chettinad cuisine .It is mainly served along with Idiyappam in functions.This goes well with idly and dosa as well.Those who have tasted this side dish will make this as a regular one in their homes.Till recently I used to cook this only when I had enough time because I used to follow the time old method of first cooking this small brinjals and potatoes along with the skin and then removing it.It is indeed laborious and it requires a good amount of time.Nowadays we get big brinjals,of those we can easily peel off the skin.Infact we can peel off the skin of the potatoes too.So cooking of this dish has become easy and fast using this recipe. Peel off the skin of the brinjal and potatoes and pressure cook them along with 4 green chillies adding two cups of water.Cook for 7 minutes or 3 whistles.Meantime mince the onions and tomatoes.Soak the tamarind and the salt needed in a cup of water.Open the cooked and smash the cooked vegetables well with the help of a potato smasher or a thick laddle.Add the tamarind salt water into the cooker.Now keep the kadai in the stove.Season the dish with the items given for seasoning.Add the minced onion and tomato.Saute well till the tomato gets cooked.You can either add the contents of kadai into the cooker or the mixture in the cooker into the kadai and bring the whole thing to a boil.Switch off the stove.Add the minced coriander leaves.Your Kosamalli is ready. On repeated request from my blog readers ,I have thought of catering kuzhambu milagai thool to my readers on order. For details you can contact me through comment section or message me in my facebook page https://m.facebook.com/public/Solai_Chidambaram. After long time I am back to blogging. Now I find people very conscious about health and healthy food. It is a very good sign and good as long as we stay balanced . People are aware of too many things easily through the social media . I find the health benefits of each and everything we eat written by somebody every minute in the social media. I genuinely doubt how reliable these information are . So friends don't get too much carried away by these articles .Always try to be balanced . We know in olden days our ancestors were very healthy. They didnt have any cardiac trouble or much of the common diseases common these days . We all know they consumed less rice and had ragi and such other grains in their daily diet. But at the same time they balanced their food by having ghee in their diet .They very casually had mutton in their diet . Now we are scary of all these and very rarely have these but want to stick to healthy food ( fat free ,carbohydrate free etc ) . I am not trying to tell that this is bad but too much into anything is not good . I have come across many experiences .one of our relative completely stopped salt telling the sentence " uppu thappu " and with in three years he died due to lack of sodium. We need all the food that we had from time old days for a healthy living. I myself thought carrot is very very good and now today I read an article that too much of carrot is dangerous. We very rarely try to find the authenticity of the information . Sometimes we will find one of our friend has lost much weight and will ask them what they have done and try to follow that . They would have balanced their diet with something else which information would not have been correctly conveyed. Now a days I even find people taking semiya ,rava ,noodles etc to avoid rice which certainly is not an alternative since it is not good for the stomach and will cause digestion trouble in the long run. So friends don't deny yourself of any food that you love and try to be balanced. We all know too much of anything is bad. Have the seasonal fruits and vegetables. Now a days I find people stopping medicines for sugar, hyper tension etc and follow the natural remedies published in the media .There is too much of information stuffed through the media . So we should be careful before following them. We certainly should be aware of some healthy food recipes and should have them in our diet . So my next few blogs will be of that kind . I may or may not be correct but this is what I felt and conveyed my thoughts . I would like my readers to express their thoughts also here through comments so that I know your opinions too. This recipe was a long wanted one from my readers.I always want to make sure that the one that I write should be safe and healthy especially if it is for kids. So I tried to get the recipe from the people who know this the best and is doing it for their grand kids right now. In a sauce pan in low fire dry roast each item for a few minutes.let the grains cool then transfer it into the vessel in which you take for grinding. While taking it for grinding take with you half a kilogram or 1 kilogram of raw rice and grind it in the machine first before grinding the sathu maavu inorder to make sure that the machine is clean from anything grinded before we grind. Morning time is the best to feed the baby this porridge. From 6 months this mix is safe.Take one and a half table spoon of this powder mixed in 50 ml of milk that you give the baby in a sauce pan and in low fire make the porridge stirring continously till it becomes semi solid. Feed the baby the porridge in luke warm temperature. Little bit of sugar can be added if necessary. Start with very very low quantity like a teaspoon on the first day and slowly increase the quantity. This is the case for all food for kids. Start with very low quantity. You can increase proportionately the quantity as per need and prepare the mix.If possible dont store it long. The name itself is mouth watering for those who have tasted it before. This is one of the easiest and tastiest desert that a person new to cooking can try. If you are sure about the measurements then you can never go wrong . So a newly wed girl who has not much experience in cooking can impress her in laws or her partner with this desert. This does not require any new ingredient from the store. So if you have rice,milk and sugar at home you are good to try this. Soak the rice for 10 minutes if you have time. This desert will come good in pressure cooker so make use of it. Keep the cooker in the stove add rice milk and sugar and mix well .Close the cooker with out the weight.wait for the pressure to come put the weight .Wait for 2 minutes and reduce the fire to low. Keep in mind that if the solid content in the cooker is much less than the liquid content then when the pressure is released or whistle comes the liquid in the cooker will come out. To prevent this we have to cook with the stove in low fire. Here milk is much more than the rice.so we have to make sure that we cook in low heat. The cooking time is 30 minutes.Switch off the stove after 30 minutes. Wait for the pressure to settle down then open the cooker. Your deser is ready.Those who want it more rich can fry the broken cashews in ghee and add. If desired cardomom powder can also be added. I generally dont add any of these as the desert will be rich and tasty by itself. Boiled eggs in any form is tempting for people of all ages. That too egg in a rich gravy,it will be really mouth watering. This Chettinad egg masala is very easy to cook even for bachelors as it does not require any grinding. Now a days there is a mushrooming of Chettinad restaurants in all levels from five star to road side shops naming themselves as Chettinad. I am really proud that every one is fond of Chettinad food. My only concern is that people have a misconception about Chettinad food that it will be very spicy and will made of hand grinded masala.The truth is that Chettinad food will be very mild and with very little grinded masala.Chettinad achi as I have mentioned several times in my previous blogs that they don't use too much of anything.I have seen my mom,grand mom and the relatives of my elder generation taking 6 to 7 ladies finger,4 small onions,3 pods of Garlic and a very small tomato for a ladies finger sambar. The amount of thoor dhal they use will be one hand full.Another thing that I want to tell here that they use only one kuzhambu milagai thool for almost all veg and non veg curries. Coconut is very rarely used and when used also very little is used as they believe that too much of coconut will spoil the taste of the gravy.They don't use much oil too.It is the care and patience of their cooking makes the food delicious. Last week we went to a famous chettinad restaurant in town and ordered for a Chettinad mushroom gravy.The gravy which was served was really mouth watering with oil on top and full of masala.since we are not used to so much of masala we couldn't finish the dish though we liked it. It was 8 pm that we had our dinner out there. By 12.30 I got up with some pain in the stomach and was lying in the bed thinking of what to do. With in ten minutes my husband also got up complaining of some burning sensation . 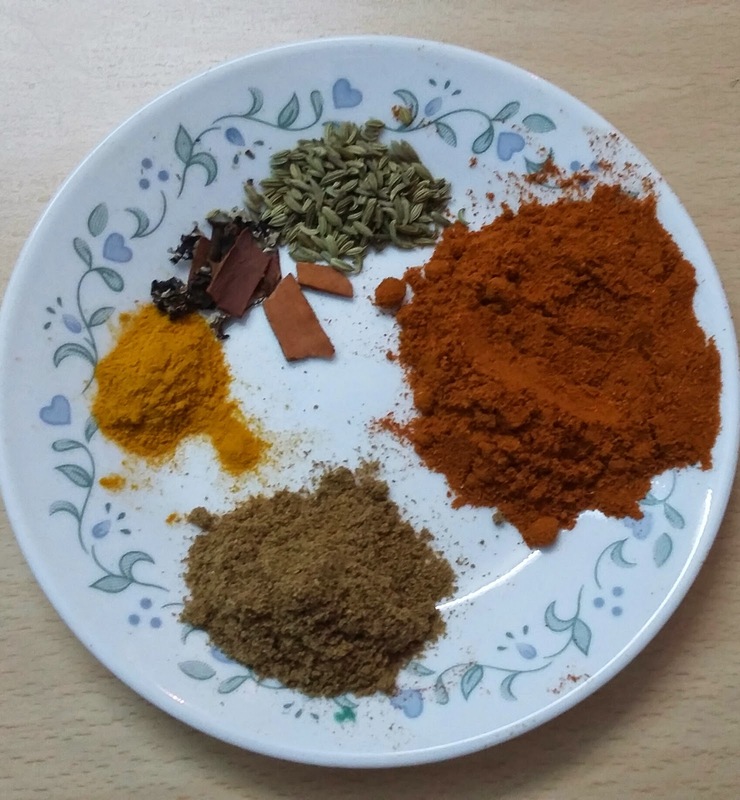 The next two days was really bad for us.This incident really made me write this blog.Please dont use too much of spices and grinded masala thinking of making the gravy tasty as it is not good for the stomach.Be very careful while using oil too. Use oil in correct quantity.Too less oil also will make the dish taste less. 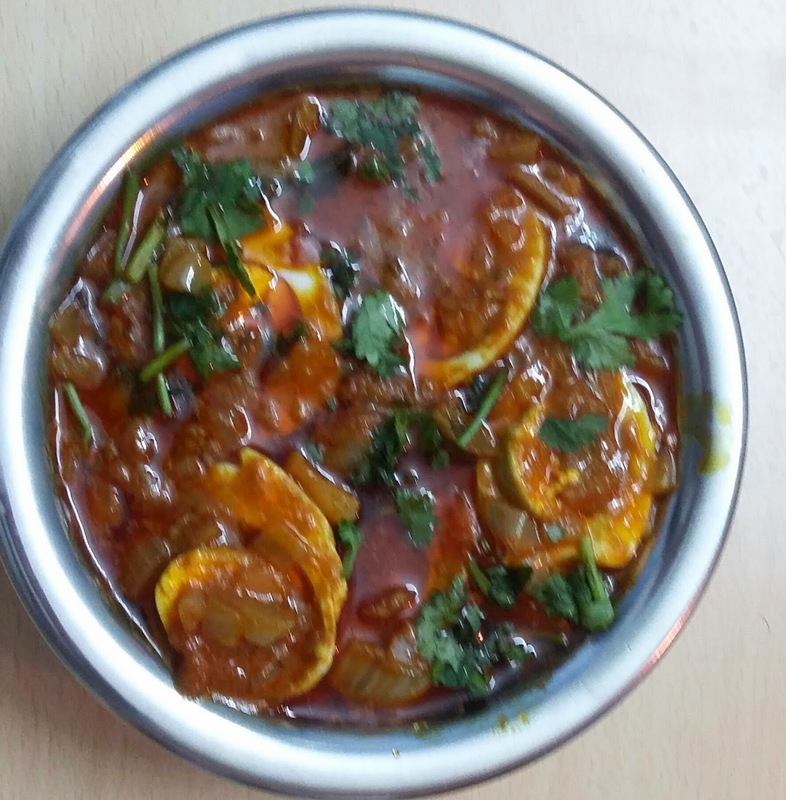 Coming to our egg masala it is very simple and easy and does not require too much of ingredients.9 out of 10 times we think of egg curry only when we run out of vegetables or when we want something fast.So this recipe will be handy that time. Boil the eggs for 20 minutes with eggs immersed in water in a kettle.Let the eggs cool.once they are cold bring it under running water and peel off the shell.Cut the eggs into halves and keep aside.now for the gravy keep the kadai in the stove.In two table spoons of cooking oil season the gravy with a teaspoon of fennel seeds,3 small pieces of Cinnamon,2 cloves and few curry leaves.add the minced onions and a pinch of salt and saute for 2 minutes .Now add the tomatoes minced and saute for 2 minutes.when the tomatoes turn soft add the kuzhambu milagai thool,turmeric powder and coriander powder,salt required and mix in low fire.high flame will burn the powders,so be careful.once they are mixed add a cup of water and cook in medium flame for 10 minutes.when you feel that the gravy is in the desired consistency add the boiled eggs and cook for 3 more minutes. Make sure that there is enough gravy for the eggs to be inside the gravy.If you want gravy to be more ,double the onion and tomatoes and the masala powders. Before adding the eggs taste for salt and spice if found less add them. Finally garnish with coriander leaves. 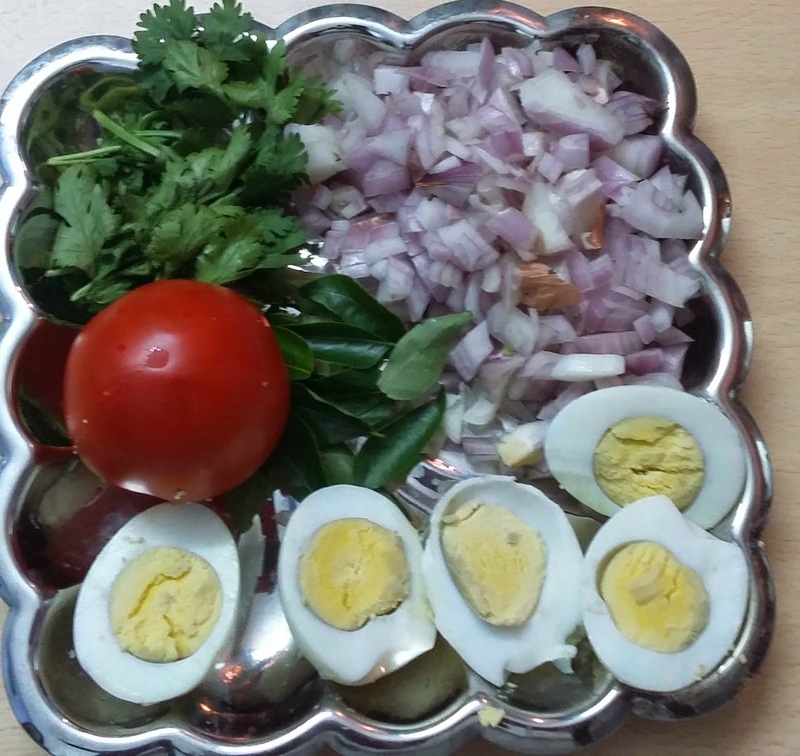 This recipe will take only 30 minutes to cook as we can make the masala while we are boiling the eggs. Whatever may be the color of cabbage you choose to cook,you are not wrong.Both are very low in calories and high in fiber and nutrients. Wash the cabbage and keep aside.keep the kadai in the stove.In one table spoon of cooking oil season the fry with a teaspoon of mustard and urudh dhal along with little curry leaf.Add the minced onion and green chilies.Saute for a minute.Now add the washed cabbage.keep the fire in medium.The water in the washed cabbage will be enough for it to cook. Mix well and close the kadai. After five minutes check whether the pieces are cooked. If not add the salt needed and sprinkle some water and cook for three more minutes.Once it is cooked to your desired level add the shredded paneer and cook for two more minutes.